Is there any food more quintessential to breakfast as oatmeal? The ways in which we like to serve it change over time, but the use of hulled oat grains remains a constant. The old-fashioned hot porridge version of oatmeal gave way to chilled overnight oats a few years ago. Made the night before and requiring no cooking, refrigerators were stocked with jars filled with creamy oats and a variety of mix-ins. For those that didn't have time, individual portions of oatmeal in a wide range of flavors began appearing on supermarket shelves. Baked grains brings back the warm, homemade aspects of an oatmeal breakfast, but in an updated format for those that don't relish porridge. Made in a large casserole pan, it's creamy, sweet, and highly customizable. Use any kind of milk you like, change up the source of sweetness from sugar to more natural forms like honey and maple syrup, and incorporate a wide variety of fruit and nut options to suit every taste. It's a hot, comforting breakfast on a cold weekend. But we can never fully get away from the busy rush of weekday mornings and the need for something portable, filling, and nutritious. This recipe takes all the best aspects of baked oatmeal and puts them in muffin form for an easy on-the-go breakfast. Unlike traditional cake-like muffins that need to rise in the oven, an oatmeal muffin recipe is remarkably forgiving. The finished texture is soft, chewy, and fluffy on the inside, while still crispy on the outside. It's definitely more dense than the muffins we buy at the bakery, but it's far from being dry and hard. And just like the casserole version, these muffins are highly customizable. The bananas add natural sweetness as well as the wonderful aroma of banana bread, while the addition of tahini adds a nutty flavor and an extra dose of protein. 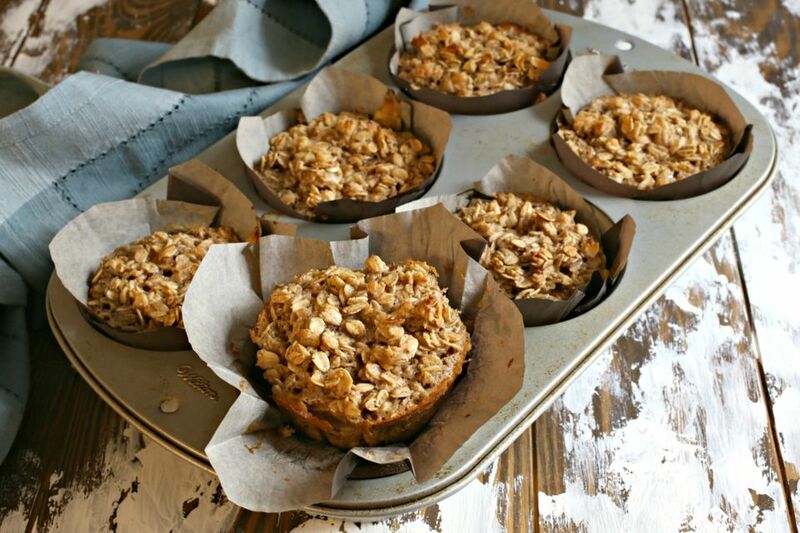 However you customize them, these baked oatmeal muffins will provide a hearty, comforting breakfast, one that will keep you full and satisfied, in portable form. Grab a container of Greek yogurt to serve with them, and freeze any leftovers for future breakfasts. Add the melted butter and granulated sugar to a large bowl and cream together using a large whisk or with a hand or stand mixer until well combined. Whisk in the eggs, vanilla extract, mashed ripe bananas, tahini, and milk until smooth. Whisk in the salt and ground cinnamon and make sure they're well incorporated. Using a large spoon, fold in the rolled oats until well combined, but note that the mixture will be very wet. Line an 8-cup muffin tin with liners or butter and flour the cups. Spoon the mixture equally into the cups and bake for approximately 45 minutes or until the top is set and a light golden brown. You can also bake this batter into a casserole to serve a crowd. If doing so, use a 9x13-inch baking pan and bake for 50 to 60 minutes. Try cinnamon and apple or pear instead of banana. When fresh berries are in peak season, toss them into the batter as well. Nut butters like peanut, almond, or cashew can easily take the place of tahini, while still imparting deep nutty flavor.